Thirty Six years ago, at 3.30 in the afternoon of 16 August 1977, Elvis Presley was pronounced dead at the Baptist Memorial Hospital in Memphis. His girlfriend, Ginger Alden, had found his body a little more than an hour earlier, collapsed on the floor of his Graceland bathroom. He had had heart failure while siting down and reading a book entitled 'The Scientific Search for the Face of Jesus'. Elvis was only 42 years old. Thirty Six years ago, at 3.30 in the afternoon of 16 August 1977, Elvis Presley was pronounced dead at the Baptist Memorial Hospital in Memphis. His girlfriend, Ginger Alden, had found his body a little more than an hour earlier, collapsed on the floor of his Graceland bathroom. He had had heart failure while siting down and reading a book entitled 'The Scientific Search for the Face of Jesus'. Elvis was only 42 years old. Within hours of the announcement of his death, vast crowds of mourners were assembling outside Graceland. When the gates were opened the following afternoon to allow them in to pay their respects, the queue stretched back more than a mile down Elvis Presley Boulevard. When Elvis' body was finally transported, in a cortege of white Cadillacs, to the city's Forest Hill cemetery, more than 100 vans were needed to transport the floral tributes from fans. It was a send-off fit for a king. The following weeks would see a feverish burst of activity from his record company, RCA, as they struggled to accommodate the most extreme example so far of that peculiar melancholic affection that spurs fans to rush out and purchase something, anything, by the recently deceased, as if struck by guilt for not having bought more during the dead star's lifetime. 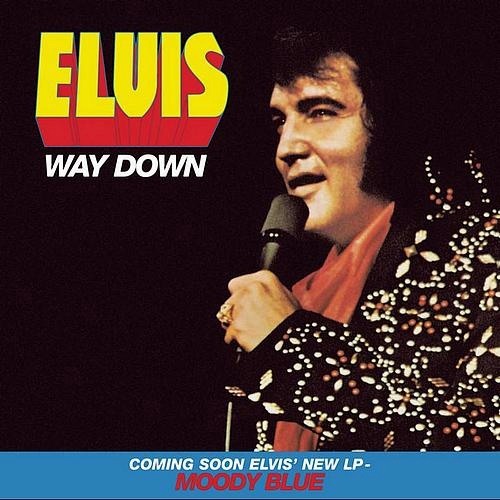 By September, there were no fewer than eight reissued singles joining the final hit released in Presley's lifetime, ‘Way Down’ in the UK Top 50 and ‘Way Down’ had also made Number One. Another 10 albums scuttled their way back into the LP charts. The label bosses, and especially Elvis' manager, "Colonel" Tom Parker, must have been delighted at their cash-cow's posthumous performance; little did they realise that, even as they were counting the profits, they were losing control of Elvis. 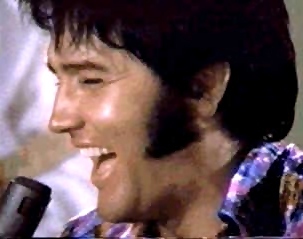 RCA may still have been making money off their departed super-star, but their efforts, and those of Priscilla and Lisa Marie Presley, to determine the manner in which Elvis would be remembered, were rudely brushed aside by the public and the Elvis fans alike who asserted a kind of collective ownership of this most distinctive of American icons. In its own way, this public reclamation of Elvis was a long-overdue snub to the way in which Col Parker, particularly, had mishandled Presley's career, insisting on presenting him as some kind of bland, airbrushed matinee idol, little better than the likes of the Fifties teen idol Fabian, when Elvis' real claim to fame lay in his being the one who had opened the Pandora's box of suppressed teenage desires, and brought a tremor of authentic sexuality to a ruthlessly neutered post-war entertainment industry. From the moment he died, Elvis was suddenly liberated, free to assume all manner of disguises and manifestations, from the comic to the sinister to the religious. It was as if fans, long cowed by the tragic reality of Elvis' later career path, were now able to assert their own notions of the star, to repossess the spirit of rock'n'roll long since purloined by corporate interests and his greedy manager. Within weeks of Elvis’ passing, the first sightings were reported of the supposedly dead Elvis, waiting in a supermarket queue, driving a truck, or filling up at a gas station. This was the power of his legacy, bigger than life itself. 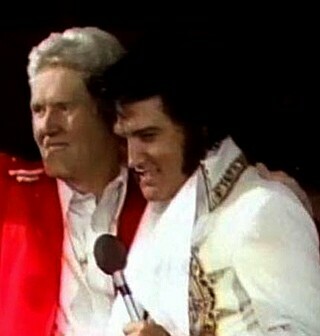 Revealingly these usually involved "Elvis" in mundane blue-collar situations routinely undertaken by most of his fans. Though in life Elvis had become a rich recluse, a person apart from his public, in death he could now become one of them again. The proliferation of Elvis sightings has become a collective joke since then, most now being propounded with tongue firmly in cheek. 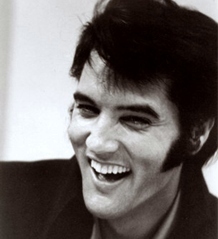 Elvis was always "crazy" and ready for a laugh and like many in the 1970s he could apparently recite various Monty Python routines by heart – so Elvis himself would probably have appreciated the gag. 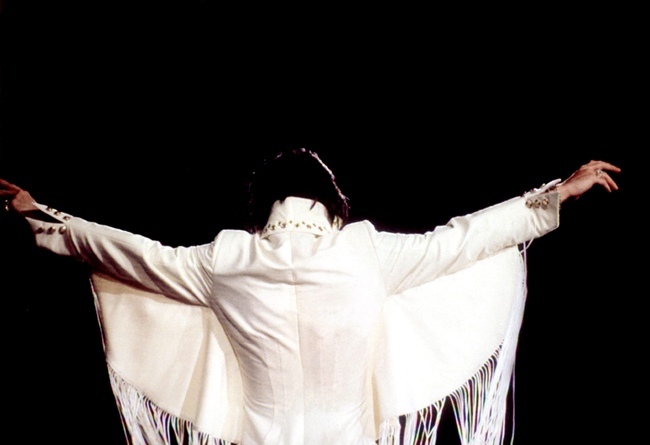 Back in 2002, now over ten year ago, the funked-up remix thrust Elvis back to the top of the worldwide charts with "A Little Less Conversation", an amazing 46 years after his first major hit, and 25 years after his passing. 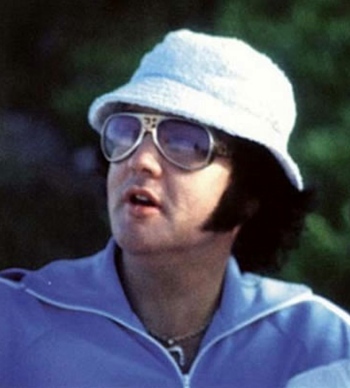 Perhaps the obsessives and loving fans are right: Elvis will never die. Or, to paraphrase the more religious of those obsessives, he died only to rise again, more powerful than ever. Everybody knows the story of Elvis, even if they haven't seen any of the largely lamentable biopics and lacklustre documentaries about his life and career. 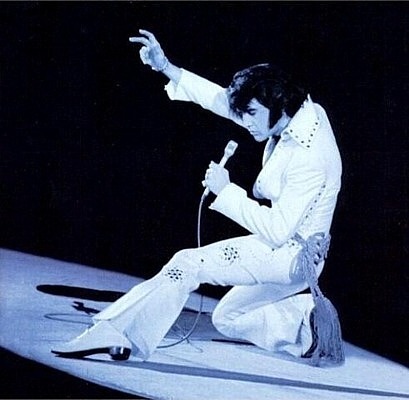 My own take on Elvis is that his life was a classic three-act opera, the first act depicting the blazing comet of youthful success, the final act dealing with his triumphant 1968 comeback and subsequent tragic decline, and the middle act being one long betrayal, as the emasculation begun by the army was completed by Hollywood. It makes, I feel, as much sense as any short summary of his life, and at least lends it a tragic dimension that is, perhaps, the least that Elvis as a towering figure of 20th-century culture merits. Back in the fifties, to the white teenage audience primed for rock'n'roll outrage by Little Richard's pompadour and the antics of Chuck Berry and Bo Diddley, Elvis was the liberator, the one who opened up a whole new set of possibilities about the way you could live, the bold new way you could do something as basic as walk down the street with a certain swagger. And in his unashamedly black-inflected vocals Elvis was the true liberation from the white-bread Middle-Of-The-Road schlock that dominated postwar American pop. As Bob Dylan would later admit, "Hearing Elvis for the first time was like a jailbreak - and I didn't even know I was in jail". Or, as the cultural theorist Camille Paglia put it, when comparing Elvis to that earlier media super-star Lord Byron, "Energy and beauty together are burning, godlike, destructive". Within months of his arrival on the national stage, the godlike Elvis had destroyed the old showbiz order, rewritten the rules on young desire and initiated the era of the teenager. BEFORE Elvis, there were no teenagers - older children were just adults in training, apprentices to the past; AFTER Elvis, there was youth culture, the most powerful commercial force in the history of the world. 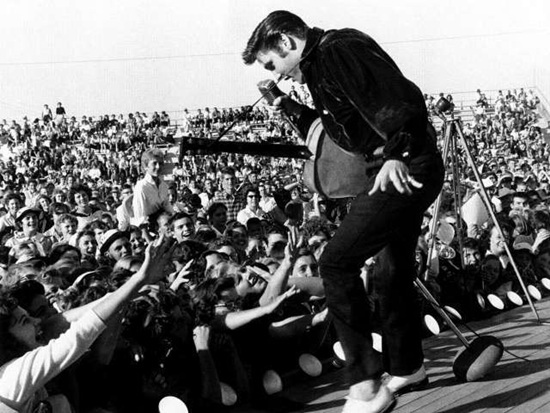 Elvis gave an entire generation an idea of itself as a generation, rather than an afterthought of history following in their parent’s footsteps. "It was like he came along and whispered a dream in everybody's ear," said Bruce Springsteen, "and then we dreamt it." 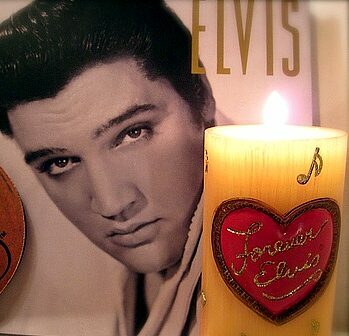 This Friday, August 16th, 2013 was the 36th Anniversary of Elvis' passing. 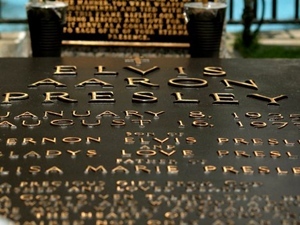 Elvis, Vernon, and Gladys Presley are all buried at Graceland in the Meditation Garden area in the massive backyard, along with his grandmother and a plaque to Elvis' twin brother Jesse Garon who died at birth. Walking up to the Meditation Garden with the glowing candles.. as deep and soulful Elvis songs play in the darkness.. it is always an unforgettable experience that words cannot properly explain, but something that every true Elvis fan should share at least once. -Copyright EIN August 16th 2013. Do Not reprint or republish without permission. For this special day August 16th EIN presents 30 classic and sought-after Elvis Family photos. Don't miss out on these 30 rare and emotional photos of Elvis and his family. From EIN's Rare Elvis Photos Facebook page, now with over 2,000 members including many of Elvis' friends!